I remember a time I used to love playing board games. My brothers and I will challenge one another on Monopoly and Scrabble. Minimum to play is two players. Four is best. We enjoy outwitting opponents. Through Monopoly, we learn about investments, and be pleasantly surprised by wild cards which give us get extra bonuses to buy properties or accumulate title deeds. We take turns to rake in the profits and laugh when we get to charge high rental or exact payment from anyone falling into our hot zones. The fun increases with more people joining the game. The same goes for Scrabble. The more the merrier. Through Monopoly, I learn about investment. Through Scrabble, I get challenged on strange words, and at the same time, learn about strange and unique words that I have never heard of. One thing is common. When it comes to board games, one cannot play alone. I know how it feels to try to play Scrabble alone, by turning the board back and forth, to pretend I am both players, and to try to outwit myself. Boring. Nowadays, it is common to see people playing "Angry Birds" or "Temple Run" by themselves. Just watch what people normally do at bus stops, or in subway trains. Even among traveling friends, they are often looking and talking more on their cell-phones with a distant person, than to chat and mingle with their friends next to them. Times have changed. Since the invention of the video games, all we need is an electronic console and any one person. Many consoles are designed in such a way to allow one player to play at any one time. Unlike board games, there is no need for a quorum of two. With the popularity of smartphones and small electronic tablets, technology has become our constant companion, our travel buddy, and our sleeping partner. It follows us wherever we go. We use them to snap photos. See the difference in the two photos below? This week, the Roman Catholic Church has got a new Pope. As people wait for the official announcement, In a striking contrast of the changing face of society, the photo shows at least three major shifts in our culture. Firstly, note the pervasiveness of the electronic phones and tablets. Technology has squeezed its way and taken over much of our lifestyles. We have moved from a less technological dependent society to a very technology dependent culture. In fact, technology has become the face of our new era. Previously, it is rather expensive to carry a cell phone. Now, cellphones have become a commodity. It is now strange to find anyone without a cellphone. Secondly, we are becoming more 'indirect' people. People's way of viewing the world has moved from seeing the person with our naked eye, to snapping pictures or taking a video through our electronic gadgets. Sometimes, I really wonder where is all the fun at the zoo, when we prefer to fiddle with our electronic cameras to get the best shot on film, instead of simply admiring the beautiful creature before us. Once I tried to get a good pose with a dolphin, and in the process, failed to connect with the curious dolphin wanting to be friendly. Seeing that I was more interested with my cell-phone, the dolphin swam away. I missed both the shot and the joy of connecting with the lovely creature. Thirdly, the photos above are rather misleading. Technology for all its good, can be used deceptively. In fact, while the place is still St Peter's Square at the Vatican, and the people are real, the contexts are different. According to this report, The 2005 photo is taken when the people were waiting to catch a glimpse of the body of the late Pope John Paul II. 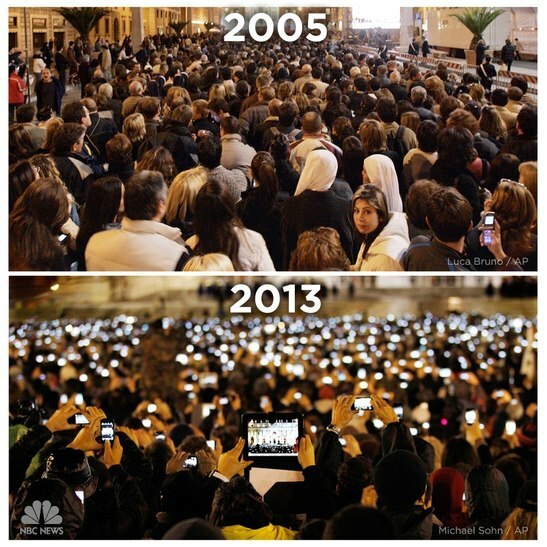 The 2013 photo shot is the real picture that shows people waiting for the new Pope Francis I. POINT: Technology can be used to to change lives, or to be manipulated as a tool of deception. relative truth over absolute truth. Locke goes on to quote the works of two Boston psychiatrists in Overcoming Loneliness in Everyday Life, that groups tend to "fail to replicate the sense of belonging we have lost. Attending weekly meetings, dropping in and out as one pleases, shopping around for a more satisfactory or appealing group - all of these factors work against the growth of true community." In a nutshell, if technology is pervasive, the disease of individualism is even more pervasive. If cell-phones liberate us from wires, it has not liberated us from de-linking our insatiable needs for self-satisfaction and self-seeking desires. Instead of becoming more community-like in our cell groups, many small groups are in danger of becoming collections of individuals looking out for themselves, instead of communities of faith looking out for one another! POINT: Beware of bringing in individualism into communities, and as a result turn communities into a giant collection of individuals. Since the first murder of the world, we have seen how sin has isolated all of mankind. In Genesis 4:13, see the three effects of sin. The Blame Game: Cain blames God for "driving him from the land"
Sin has spread from Adam and Eve to Cain. Like Adam who blamed Eve, and Eve who blamed the serpent, Cain subtly blames God for driving him out of the land, instead of accepting that he has done wrong. Cain is aware that being out of fellowship with God, he will be in trouble. He will have needs but will never have his needs truly met. That is the devastating effect of a restless wanderer. Like our technological gadgets that automatically search for the strongest WiFi signals all the time, the unsatisfied sinful human being is always on the lookout for something to satisfy his wants. He becomes an individualist who is more concerned about his own rights and problems. In trying to get things done his way, he has isolated people around him, just like Brian. In trying to meet his own needs, his own way, he has failed to recognize he needs something better. Fortunately, we know that there is hope. Remember the woman at the well? The Samaritan woman who hears immediately asks for a drink of such water that truly satisfies. Such an offer remains open for anyone of us who wants. POINT: Authentic beings come from being made authentic first in Christ. We need to move from individualistic concerns toward community building. If we want to follow after God, remember that God is Father, Son, and the Holy Spirit? God is the Triune Godhead. God is the Divine Community. Like the famous saying, "No man is an island," we need to remind ourselves that we cannot exist for the sole purpose of ourselves. We need to acknowledge that we need help. We need to be part of a community for the sake of the community. We need to put our own needs in perspectives, that we exist not for the purpose of puffing ourselves up, but to give ourselves away for the kingdom and glory of God. We need the water that satisfy, that we may be used to satisfy others. "I must fully participate as a member of a community right where I live." "I must engage in a journey of learning to think, act, and be like Jesus." "I must actively use my life, my gifts, and my resources to serve others." Ditto. Let me also say, that before we can live authentically as living stones, we must first become authentic through transformation and renewal. Feed of the living bread. Drink of the living wells of Christ. Live of the Risen Lord and Saviour. In a technology mad world, let me also suggest three things we can do. Give Your Gadget a break at least once a week. Six days we use our technology. One day, we rest from it. That is a good biblical pattern to follow. Give your time away. Consider setting aside a time where you can fully and honestly listen to help other people. In fact, just listening to others, can be therapeutic for others, even ourselves. Give the gospel away. There is no greater joy than to share the gospel in a way that meets the needs of others. We do not share the gospel so that we fulfill the obligation as Christians. We share so that others and truly taste the sweetness of Scripture, and the bountiful promises of God.